The most striking aspect of Mount Carmel is its typical Mediterranean scrub forest. A park forest, characterized by relatively well-spaced trees, grows on the land which is up to 200 meters above sea level. Carobs are the predominant tree in this particular park forest. A kermes oak forest grows in the areas at an altitude of higher than 200 meters and in the damper parts of the mountain. There are beautiful groves on the slopes above Kibbutz Yagur, near Nahal Kelah (known as Little Switzerland), and in Keren Hacarmel. As a rule, the thicket that grows under the kermes oaks is so tangled that people cannot walk between the trees, but the park staff has blazed some trails, most of which are signposted. Kermes oaks are relatively small and have only one trunk. Terebinths, strawberry trees, and buckthorns grow alongside the kermes oaks. Arrowwoods and laurels grow in the deep, especially well-shaded channels. The Ha'arbaim Grove (near the University of Haifa) is part of the nature reserve. Its more than 80 kermes oaks are remarkable for their size. Local residents considered these immense trees holy and accorded them special treatment and protection. The Carmel Mountain Range also has one of the only natural populations of Aleppo pines in Israel. Forests of Aleppo pines grow on the chalk in the higher reaches of the mountain, especially near Ussifa and Kibbutz Beit Oren. This area is magnificent in the spring when anemone, cyclamen, orchis, and a host of other flowers bloom on the ground that is exposed to the sun, i.e. outside the scrub forest. Madonna lily, a flower seldom seen in Israel, blooms in Little Switzerland in May. 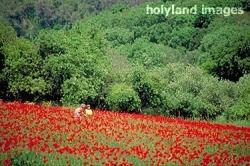 To get to the Mount Carmel National Park, take Route 4 (the old Tel Aviv-Haifa highway) to Oren junction and turn east. From Route 70 (Faradis-Yokne'am), turn west to the Eliakim interchange and at the city of Nesher, head towards the University of Haifa.